Short range proximity wireless technology reduces nocive radio emissions, optimizes power consumption and improves security in connected applications. Near Field Communication (NFC) is growing in consumer recognition, but it remains strongly associated with payment or transportation because of its roots in the smart card industry. NFC is, on the other hand, a potential IoT enabler because it responds to several concerns in an interconnected IoT environment. First, a couple of fundamental points to keep in mind as you assess how you might use NFC. NFC is a short range (proximity) technology that broadcasts only up to 3 cm. NFC involves a passive tag or “listener” device, which is powered by an active “poller” system such as a smartphone or card reader. NFC is a bidirectional channel capable of data rates up to 424 kbps. This is not extraordinary when compared to Wi-Fi, but it is certainly enough for many IoT use cases such as basic data collection and system control. 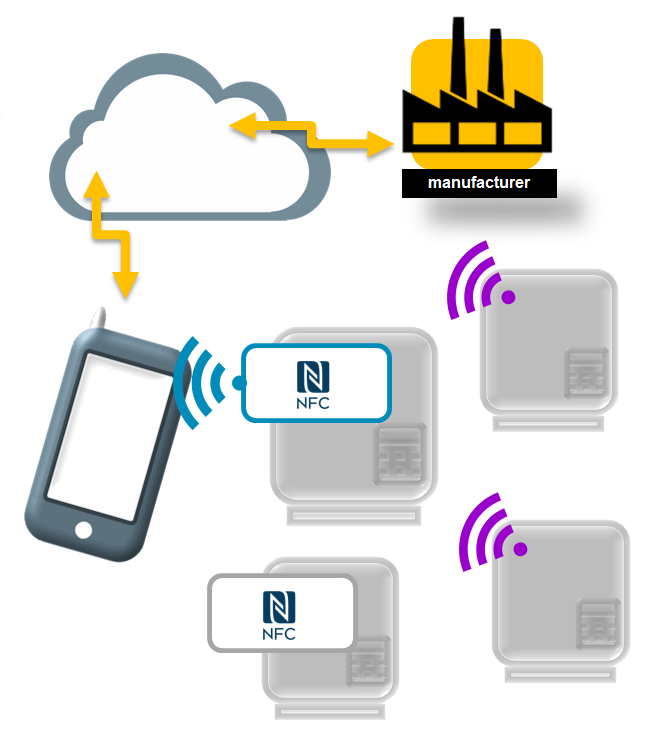 In the IoT, discretion will be key advantage of NFC. In a connected world where every-other machine or sensor will soon be broadcasting something, using Bluetooth, Wi-Fi and other longer range technologies will be like putting a sign on a door to your machine that any dishonest, malicious and just curious person might want to try to open. The NFC listener, however only broadcasts when it is powered by the presence of a polling NFC device (a smartphone or reader). It is only powered when the poller is within 3 cm. This implies the physical presence of a user who has some knowledge of the machine and where the NFC interface is located. We already have the experience in RF-crowded public environments where we can easily find dozens of Wi-Fi connections and ask ourselves, "Now what do I connect to?" The large number of objects that will soon have local connectivity (whether NFC, Bluetooth, Wi-Fi or some other channel) in an IoT environment presents a real challenge for the end user. This is heightened by the depersonalized nature of the IoT environment where objects are more likely to be identified with serial numbers as opposed to names like "John Doe's Air Conditioner." In this complex, depersonalized IoT environment, how does a maintenance worker efficiently identify the one system out of 20 that he is supposed to test, reconfigure or update? Correctly associating the physical object with a name in a long list of Bluetooth devices on his service terminal is guaranteed to be tedious and haphazard. Errors will occur. With NFC, the challenge is solved. The user simply approaches the smartphone to the NFC marking on the product that he needs to work on. The smartphone wakes up the NFC interface, this component then wakes up and pairs other appropriate communication channels such as Bluetooth or Wi-Fi, which may be necessary. The maintenance user is sure to connect to the intended machine. There's no risk of inadvertently selecting the wrong communication channel and accidentally connecting to a nearby machine. There is no risk that another nearby user steals the connection. Power consumption will be a third key advantage of NFC. Already the NFC listener has relatively low power consumption at less than 5 mA during communication. More importantly, the listener NFC device draws power from the poller and not from the system that it is installed on. The listener need not be powered at all in the absence of the poller. When used in combination with other RF technologies like Bluetooth or Wi-Fi, the NFC listener detects the presence of the user’s smartphone, wakes up the primary interface (such as Bluetooth) and pairs this interface with the Bluetooth interface of the user’s smartphone. For all of these reasons, the IoTize design team implemented NFC in our first modules that allowed a local connection to information appliances such as smartphones. This resulted in our first prototype, the "TAP" which explored the use of an NFC only solution. The technology has been so convincing that NFC is now included in all road-mapped TapNLink and TapNPass modules. The NFC channel can serve as the primary communication channel supporting user cases for product configuration, operator control and over-the-air firmware updates. It also serves as a complementary interface to other wireless technologies for the advantages it offers in reducing unwanted radio emissions, reducing power consumption and securing access.